The final WorldSBK race of the weekend continued to provide action and entertainment from lap one, with hard passes and an exciting battle taking place. Out in the lead of the race once more, Alvaro Bautista took his ninth consecutive race win to equal 2003 WorldSBK champion Neil Hodgson in winning the opening nine races of the season, as well as giving Ducati their 350th WorldSBK win. Bautista took the advantage from pole position, seeing-off Jonathan Rea (Kawasaki Racing Team WorldSBK) into Turn 1. For the first time in the weekend in the blue-riband class, everyone made their way through the opening corners safely and without drama. Chaz Davies was an early improver and up to third place, whilst Alex Lowes was a strong fourth despite dropping back. Tom Sykes wasn’t the fastest starter and dropped back, allowing a rapid-starting Jordi Torres (Team Pedercini Racing) and Eugene Laverty (Team Goeleven) to get in close proximity. A move made by Davies at Turn 7 on lap two to get ahead of Rea and pushed the reigning four-time champion back into the jaws of the chasing pack. An action-packed second lap saw passes galore, with Tom Sykes making an error at Turn 12 and seeing Leon Haslam (Kawasaki Racing Team) and Jordi Torres pass through – Torres now sixth from eighth on the grid, one of the strongest showings in WorldSBK by the Team Pedercini Racing Kawasaki. Alex Lowes was starting his comeback through the order, up to third position at Turn 1, ahead of Rea, who was starting to look vulnerable. Rea was now down in fourth and his teammate, Leon Haslam, was closing him down too. Behind this squabble over second position, Eugene Laverty was closing too, having disposed of Spanish home-hero Torres. On lap eight, Davies began to pull away and put some distance in between himself and Lowes. Rea ran wide and took teammate Haslam with him; the Kawasaki riders were not looking like they were going to be able to mount a podium challenge. Lowes challenged Davies but was not able to make a pass. Further down the order, Toprak Razgatlioglu (Turkish Puccetti Racing) retired. With Laverty dropping back from the battle for second and not able to initiate a challenge for the podium, Rea was starting his own resurgence, passing Lowes at Turn 7 but Lowes was able to get back ahead at Turn 8. Rea eventually made the move stick at Turn 12, dispatching of Lowes and soon setting off after Davies, who was escaping. Two laps later, and Haslam made his way passed Lowes at Turn 1, pursuing his teammate and Davies in second. Lowes would remain in fifth, firmly planted and on his way to a tenth consecutive top five placing. Whilst Rea looked set for a guaranteed podium, teammate Haslam had other ideas and got ahead of the Ulsterman, taking over as the leader in the Kawasaki challenge. A lap later, and Rea repaid the compliment in identical fashion. The penultimate lap beckoned, and it was Rea and Davies who renewed their rivalry. Rea put his trademark passing move on Davies at Turn 4, slicing under the Welshman, only for the 2011 WorldSSP champion to fight back at Turn 5. Leon Haslam, after initially being dropped by half-a-second, was now right back in the battle for the podium; something he hadn’t stood on since Race 2 at Phillip Island. On the final lap, a mistake by Davies at Turn 1 allowed Rea to come straight through and put in the lap of his life to put distance into Davies. Haslam wasn’t able to capitalise on the mistake by Davies and whilst Davies was coming back towards Rea into the final corner, there was nothing he could do to get ahead. Bautista took the win, ahead of Rea by another huge margin; the ninth time that those two have finished in that order in 2019. Davies completed the podium for the second time at the Motocard Aragon Round, whilst Haslam and Lowes completed the top five. Laverty took sixth, ahead of Jordi Torres – taking his fourth consecutive top ten finish for the first time since 2017, during Race 2 and Portimao. Michael van der Mark completed his weekend with an eighth place, ahead of Michael Ruben Rinaldi (BARNI Racing Team) and Sandro Cortese (GRT Yamaha WorldSBK). Marco Melandri (GRT Yamaha WorldSBK) was a dejected 11th, with Sykes right behind, having faded mid-race. 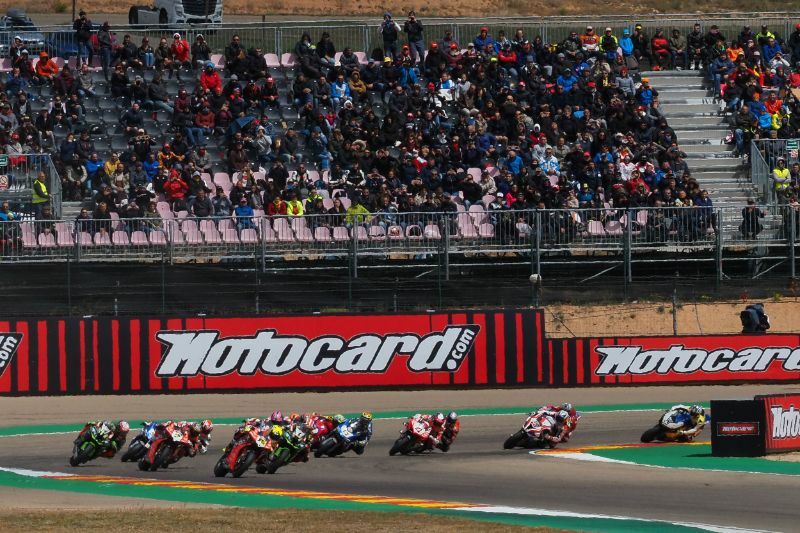 Leon Camier (Moriwaki Althea Honda Team) and teammate Kiyonari were 13th and 14th respectively, whilst Markus Reiterberger (BMW Motorrad WorldSBK Team) finally finished at MotorLand Aragon, with 15th.